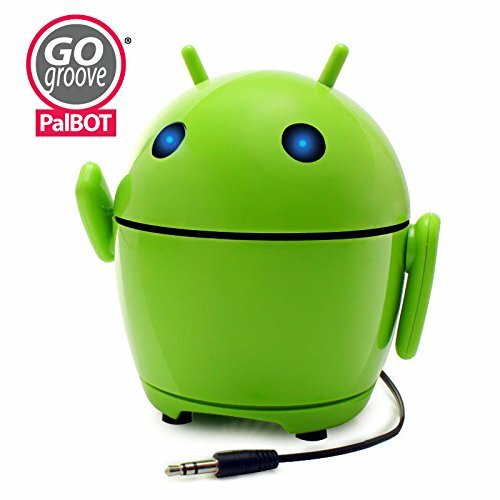 GOgroove Pal Bot is a portable wired speaker that is perfect for listening to music, movies and more, just about anywhere. Designed with an alien green design, moveable arms and glowing eyes, the Pal Bot is out of this world (literally)! Ultra-portable a lightweight Pal Bot is perfect for kids, adults, in-home music, gifts, on the go audio and more. For such small size the Pal Bot produces crisp clear sound from its stereo drivers and reactive bass woofer. This allows the speaker to put out the full spectrum of audio with crisp highs and shaking bass. Just connect to your device, adjust the volume via the onboard volume switch and experience the power of your music! The long lasting rechargeable battery plays your music for over 6+ hours on one charge and will even play longer at lower volumes! Recharge the Pal Bot via the included microUSB cable. The LED eyes will glow different colors to indicate when it's on and the current battery status. To get started simply pull out the retractable 3.5mm cable and plug in to any devices headphone port. Turn on your music and you are ready to blast off in music space! Audio Cable Length: 24 in. Dimensions: 4.0" x 4.8" x 3.3"
Nabi DreamTab HD , 2 , Jr. If you have any questions about this product by Accessory Power, contact us by completing and submitting the form below. If you are looking for a specif part number, please include it with your message.